June 4th is National Trails Day here in the U.S.—a chance to celebrate the paths for hiking and biking that weave through the country’s great nature preserves. We thought we’d take the opportunity to zero in on the outdoorsy design work that makes these activities possible. Could hiking trails really depend all that much on graphic design? It does seem like an awfully urban thought. But think again—of the trail emblems, wayfinding signage and maps that let you know where you are, plus the posters and, increasingly, web sites that help expose potential newcomers to these great outdoor activities. That’s design. And when done well, hiking trail design can be a real addition to the natural aesthetics. Read on to see what we mean. These are simple icons that serve to identify a given path as being part of a particular hike. They are critical for hikers making journeys on long trails that intersect with shorter ones, as they confirm you are still on the right track. The best emblems are simple and eye-catching, while still able to harmonize with a natural environment. The minimalist emblem for the Colorado trail, shown above embedded in a sappy tree, is a perfect example. We like the Oregon Coast Trail’s bit of color too. 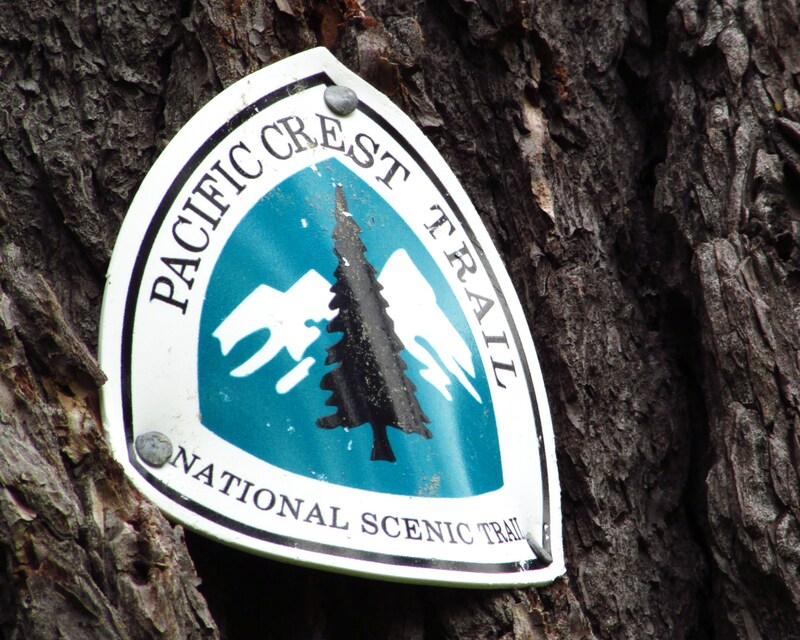 The king of west coast trails is the Pacific Crest trail, which goes all the way from Mexico, through California, Oregon and Washington to Canada. Epic, right? Both the older and newer versions of its emblem are very aesthetically pleasing. Little wonder that hikers have taken to photographing themselves in front of these signs to record and celebrate their progress. Wayfinding refers to a whole branch of graphic design involved in creating signage to guide people through complex environments, from buildings, to city centers, to hiking trails. Or bike paths. In the case of the Lisbon Bikeway in Portugal, designed by the firm P-06. It helps bikers and walkers co-navigate the beautiful path using graphic images printed directly on the ground. We also like the wayfinding signage by Steve Jones, director of Heine Jones in Melbourne. These take the classic stake-in-the-ground approach. They point hikers in the right direction and also provide sundry other information, for example of what items are allowed or prohibited on the trail. Where would a hiker be without one of these? Probably very lost. While maps often seem as if they simply came readymade with the land, in fact they are a quintessential design product that reflects many aesthetic decisions. For the above map of biking and hiking routes in Brod Moravice, Croatia, the designer Tamara Cocet updated an existing map by adding more color to better distinguish different paths. The map also indicates the topography of the land as if from above. Chris Young took a different approach for this Sun Peaks map, which provides both an overhead schematic and a perspective view, which is helpful for getting a sense of inclines. If you search for hiking trail posters, chances are the results are all going to be “vintage”—whether that means actually old or just in a retro style. We’re not exactly sure why, but part of the reason is definitely the famous series of posters for America’s national parks designed under President Franklin D. Roosevelt’s Works Progress Administration (WPA) in the 1930s and 40s. These posters were so good they instantly became iconic and stayed that way. Most “vintage-style” hiking posters hew pretty closely to the WPA style, which is characterized by strong contrasts, unmodulated color fields and bold typography. The above trail posters by Open Sky Ideas are a good example of modern outdoorsy design. The Appalachian Trail is the East Coast equivalent of the Pacific Crest trail. It stretches from Georgia all the way up to Maine. The designer Rodger Binyone takes a poster approach that depicts the trail as a map of the many states it traverses. Unlike poster designers, web designers for hiking trails don’t have any famous precedents to fall back on. It’s an open field. Carly Peak‘s mobile site project for the network of hiking trails at Panama Peak is a good example of how designers can bring the benefits of the web to outdoorsy activity. Her site provides useful information about each trail like its difficulty level, length, and other factors that hikers should be aware of. We also really like Natalie Alan‘s website project for Columbia River Gorge. The thinking here is similar, but the site is somewhat more complex and photo-oriented. Love outdoorsy design? Share your favorite example in the comments!